Melbourne Film Blog: Hallo possums! I just got back from seeing Sonnensucher (Sun Seekers), screening as part of ACMI's Focus on East German Cinema. It's an excellent film, that depicts the bleakness of life behind the Iron Curtain in a very matter-of-fact manner, leading to it's banning in East Germany for 12 years. It's so frank both politically and socially, in a manner that would be considered brave even in so-called free countries. As I rolled up in my driveway, I saw what I thought was a large rat. It was, in fact, a young possum. In recent weeks, I've been taking my son to a local park and we've been feeding the critters, much to our entertainment. This little fella seemed quite unshy and was nibbling on my ginger lilies. I held out a little piece to him and to my surprise he jumped up my arm and onto my shoulders. The missus took these shots (click to enlarge); I wasn't really able to capture much myself. He seemed keen to climb as high as he could but couldn't tackle the helmet. 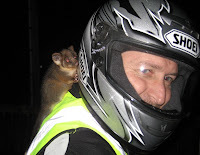 I think I was more afraid than he was, and put the visor down to make sure I don't have nasty possum claws clambering over my face. 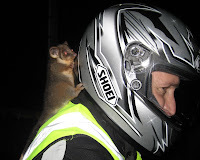 I otherwise felt quite safe with all my motorcycle gear on. He seemed quite content to stay put so I removed him and he didn't put up much of a struggle. I finally released him to a nearby tree.